Hagia Sophia: The Church of "Divine Wisdom". This masterpiece of Byzantine architecture was built by Justinian in the 6th century as a church and being converted into a mosque by the Ottomans. Today it serves as a museum with the unique examples of two religions together. Underground Cistern: This unique building dates back to the 6th century and built as a water reservoir. Containing, 336 colums and capitals of earlier temples, dim lights and chamber music in the back ground it has a mysterious atmosphere. Hippodrome: Constructed for the Roman chariot races. It was the centre for civil events witnessed many victories and riots. Beautified by the Egyptian Obelisk, the Serpentine and the Constantine Columns. Chora Museum: A small church with the best remaining examples of frescoes and impressive mosaics in hand today; Indications of a new Byzantine art movement parallel to Italian Renaissance started by Giotto. Archaeological Museum: A very fine collection of old Greek and Eastern Roman antiquity together with a unique exhibition of sarcophagi from Middle East and Asia Minor. Blue Mosque: A name given by the visitors fascinated with the blue effects of 25.000 tiles used in interior decoration of the mosque. Topkapi Palace: Main residence for 25 Ottoman Sultans for almost 400 years. Today this outstanding example of Ottoman Palace architecture and a very famous museum hosts one of the world's biggest China collection together with the treasury of Ottoman Sultans. Dolmabahce Palace: In the 19th century a new place was built for the Sultans, a very strong influence of European Architecture and interior design adopted to the Ottoman life styles. It has a reach collection of Bohemian and Baccarat Crystals, Sevre porcelains and 19th and 20th century paintings. Süleymaniye Mosque: A 16th century masterpiece constructed by the greatest Ottoman architect for the greatest Otoman Sultan. Museum of Turkish & Islamic Art: The home of Grand Vezir Ibrahim Pasha, is a museum today housing art examples of Turkish and Islamic cultures and a very important carpet collection. The Etnograpic section gives a chance to view nomadic background of the Turks. A cozy garden with the breath taking view of the Blue Mosque. Rumeli Fortress: Built before the conquest of Constantinople by the Otomans with an intention to control the Bosphorus. Constructions were completed as short as 4 months and 19 days. Today the nicest view of the Bosphorus could be seen from this well preserved Castle. 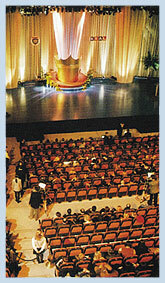 As an international center of tourism, Istanbul is a natural choice for large scale conferences. Some of the main convention centers in the city are the Istanbul Convention and Exhibition Center (ICEC), TÜYAP, Atatürk Cultural Center and the Hilton Convention Centre. ICEC is a centrally located facility within walking distance to Istanbul's main shopping district as well as 16 major hotels offering 3,400 guest rooms and meeting spaces. In addition to these conference facilities, there are many diverse and uniquely beatiful hotels able to meet the needs of booth large and small meeting groups, making Istanbul the perfect location to bring together business people from various regions of the world. Experience the exciting mixture that is Istanbul, the city where East meets West, the bridge between Europe and Asia a thriving metropolis of 12 million people - exotic yet distinctly western. Istanbul is the only city in the world built on two continents, standing on the shores of the Bosphorus, where the waters of the Black Sea mingle with the Sea of Marmara and the Golden Horn. Here, on this splendid site, Istanbul guards the precious relics of three empires of which she was the former capital (Roman, Byzantine and Ottoman) Istanbul is not only historic. The magnificent city offers a plethora of activity and museums, churches palaces, great mosques, bazaars and sights of natural beauty seem inexhaustible. Istanbul will reward you with the comforts of home while offering sights, sounds and smells that carry you swiftly to another culture, another time. Fishing on the Bosphorus & Blacksea: It is an interesting interactive event to share the enthusiasm of local fisherman. Photo Rally: It is one of the way to explore the city, learn and compete at the same time. 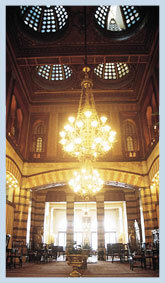 Discover Istanbul on Foot or by Public Transport: A competition and fun way of exploring different corners of the city. Canoeing: For the ones who like some excitement. Golf: In half an hour time you can find yourself in a golf course. Belgrade Forrest Trophy: Out in nature near to the city Jeep Trophies of various difficulty levels are organized by experts. Picnic & Games: Picnic out in nature with games conducted by animators and lots of fun. 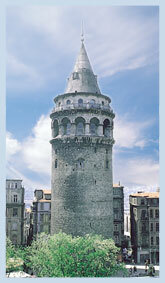 Treasure Hunt: For this team game, no city could be a better choice than exotic Istanbul. Rafting: Within two and a half hours drive out of Istanbul, an adventurous rafting can be experienced. Shopping Contest; A list of shopping and a limited money is what each group has. In a labirent like Grand Covered Bazaar with so many experienced salesman, let's see how successful each group is. Welcome Concert in St. Irene: 4th century church building, a unique atmosphere for opening ceremonies and best acoustic for classical music concerts. Surfing on the Beyoglu Bars: Find the right ones among 200 bars in the area, to get your game free beer and certificates to win the competition. You need a good team work and experience on map reading. Sultans Party: Ottoman style decoration and food from the ancient street seller's, musicians and the belly dancers, in short a perfect atmosphere and settings of 200 years past. Cocktail and Dinner at the Sea: Bosphorus is an important advantage for Istanbul to set up different Theme Parties. A) On the Boat along Bosphorus; Very elegant way of discovering the beauties of Asian & European banks of Bosphorus by a cocktail party and a dinner on private boat. B) Private Party on a Car Ferry; Dinner, show and disco on the typical Bosphorus Car Ferries for larger number of guests. C) Dining on the Fishing Boats; Catering 4-5 pax with a chef on each boat. Very tasty sea food and other local specialities are cooked and served to the guests. A very exciting and colourful experience nicely aluminated. Turkish Bath: It is a great experience to spend couple of hours in 16th century Turkish bath, washing, massage and belly dance lessons. On the final a great kebab meal. Gardens of the museums; Cocktail Parties in the gardens of Archaeological Museum decorated with statues and ancient works of art. Palaces, Pavilion's & Gardens: Unforgettable dinner in one of the many gardens or palaces of Istanbul. This romantic night is accompanied with music of violins and the taste of wine. Byzantine Night: In an appropriate setting and costumes, a theatrical atmosphere, wining &dining. Gypsy Night: Turkish meze's and specialities accompanied with Gypsy musicians, dancers and fun. A special setting and gypsies accessories. Fly for Dining in Mediterranean: Fly out of Istanbul for unforgettable sea food dinner and music down by the south coast of Turkey and fly back to Istanbul after midnight brandies and cigars on the flight.